I love technology. I have a smartphone, outlook email, gmail and paper to keep my tasks and meetings. I use a calendar all the time. I use my work calendar as the primary and the rest on and off. 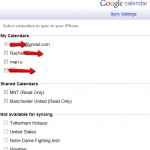 I have often thought of syncing my calender with my google calendar. I have not found a good solution. I just read an article on how to send your outlook calendar as an .isc file. So now I can send a message to myself and then import my events.